Steven Naismith: The people's footballer or disowned Ranger? It is almost lunchtime on Thursday at Everton's Finch Farm training complex and the car park is packed: one side the forecourt of every footballer's four-wheeled fantasies, the other like a used-car dealership in Widnes. The first team are in the last few minutes of what looks like a competitive session but the man we have come to talk to is already finished. Having played two games for Scotland over the international break, and with West Ham visiting Goodison Park on Saturday, Steven Naismith was on light duties, which meant pulling on a festive jumper for Everton's Christmas card, and interviews with us and The Big Issue. Such is life for a man who at times seems to be on a solo mission to prove that footballers can still see what real life is like through their blacked-out windows. Whether it is his work for Dyslexia Scotland, his scheme to help ex-servicemen into jobs, the support he gives to the homeless, or the free tickets he hands out via Jobcentres, Naismith is the working-class lad, with old-fashioned values, who has not had his head turned. Or so the cliche goes. Is Naismith the exception to the rule - of oblivious stars "living in a bubble" - that BBC pundit Robbie Savage wrote about in his players' perspective on our Price of Football survey? "Not really, to be honest," said the 28-year-old. "A lot of footballers do [charity work] but it doesn't get recognised. The majority want to give something back, and they do." 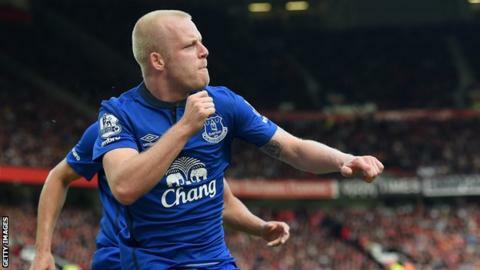 Deflecting attention is typical of Naismith; it is how he plays his football. Quietly, efficiently, he often goes unnoticed, right up until the moment he plays the killer pass or scores the crucial goal. Despite his modesty, the stereotype of football's self-centred millionaires persists, so much so that when Birmingham City's Guy Moussi recently decided to donate two months' wages to charity it was headline news. Why does Naismith do it? "I've grown up in a job that feels more like a hobby, and I'm fortunate enough to make a living out of it," he said. "Within that you get so many opportunities that could be a small thing for me but would make a big difference to people who've not had it, in my eyes, as easy. "I'm doing something I love and it just comes to me, whereas it's been harder for them, so it's a no-brainer, and I enjoy it. "The difference it makes gives me the biggest satisfaction. When you hear people come and say how much it means to them, that's the biggest happiness for me." Listening to Naismith talk brought another old cliche to mind, that we are all products of our upbringing. He grew up in Stewarton, a small East Ayrshire town, five miles north of Kilmarnock, 20 miles south-west of Glasgow. "Even when I go back now people treat me like they know me because it's a small community," he explained. His dad is a social worker and his mum works at a supermarket. He attended local state schools and worked hard to overcome dyslexia. Rangers spotted his talents first, but it was at Kilmarnock that he became the clever, industrious presence on the wing or through the middle - his preferred position - that he is today. "There's a lot of money in football nowadays and people can get carried away, but I live a very normal life," he continued. "My wife is a dentist, so she's had a fantastic education and worked really hard. These are the people that make me want to be part of a team that works hard." It is also probably why most fans like him - that and his knack for finding space and the efficiency of his finishing. He can play, and he looks like he knows how lucky he is to do it so well. Rangers supporters know this better than most: Naismith was, and still is, one of them. Having been named the Scottish Football Writers' Young Player of the Year for his breakthrough season at Kilmarnock in 2006, his fellow professionals voted him their best youngster in 2007. Rangers had seen enough and got their man for £1.9m, with just a minute of the transfer window to spare. For five years, Ibrox loved him as he helped Rangers win three consecutive league titles, a Scottish Cup and two Scottish League Cups. The last of those championships came in 2011, a year that saw him win both the club's players' player of the year and supporters' player of the year awards. And then he broke their hearts. He left when the club needed its best players most, but worst of all he left for nothing, cynically engineering a free transfer to Everton. Or so the terrace legend goes. There is not enough magic ink in my laptop to tell the full story of Rangers' lurch towards liquidation in the first half of 2012, but suffice it to say that little was as it seemed at the time and it is not over yet. But Naismith did not have the luxury of hindsight; he was trapped in the middle of a soap opera that was played out on the front, back and business pages, starring a global cast of would-be saviours and opportunist scavengers. So when it became clear that Rangers could not be saved via a deal with creditors, Naismith and his team-mates were faced with a stark choice: take advantage of their legal right to refuse to let their contracts be transferred to a new company and leave, or face further uncertainty and the third division. Rangers' new owners did not like it, and tried to stop it, but there was nothing they could do. Kyle Lafferty, Allan McGregor, Steven Whittaker and others joined Naismith in getting free transfers, while Southampton paid a relatively modest fee to expedite Steven Davis's departure. "It was a horrible situation to be in," Naismith said, speaking less freely than before. "And I can definitely say that everybody in that changing room had no interest in leaving. "Everything was fine; we were successful. But when you're doing all you can to help and it becomes impossible, you need to make a decision. "You have to think about your career. I was 25 and I could remember the day when I was 18 and it seemed to have gone by in a flash. Could I play international football if I wasn't playing at the highest level? "It was very disappointing the way I left but hopefully over time people can look back and see that I was part of a team that brought a lot of good days to the club." That day seems a long way off if the reaction on social media to the poacher's goal he scored for Scotland in their Euro 2016 qualifier against Poland a month earlier was any guide. One Rangers' fans group tweeted: "Am I allowed to celebrate that goal?" "That's disappointing and sad because it's a club I grew up supporting and I probably had some of my best memories in football there," he replied. "Throughout the whole thing the biggest thing for us players was that [no non-playing staff were] made redundant, and we did that part of it, but then when it got even further down the line…", he did not need to finish the point, the clincher was coming. "Now there's criminal activity being suggested, so over time I'm sure the truth will come out." Timing is everything. To some Rangers fans it might always look as if their heroes, and the club's most valuable assets, simply abandoned a damaged-but-fixable ship to its fate. I suspect others, however, will eventually realise that the players, led by McGregor, now Hull City's goalkeeper, tried desperately to come up with wage-cut packages to keep the club afloat. The administrators, and their preferred bidders, were not interested in those proposals, and came back with ultimatums the players had an hour to accept or reject. "Looking back I would definitely have done some things differently," Naismith said. "None of us wanted to leave that way, but I think all of us can say we did all we could. "But fans always have their opinions, and that's their right. They pay good money to come and watch. They are the backbone of a club, especially one like Rangers. "I think over the last two to three years they've been treated appallingly, and for everybody's sake I hope it gets better and they can get back into the division they deserve to be in and challenging for trophies." Fans' rights, good money, a sense of what really sustains clubs and trophies - this seemed like a good place to finish. While we packed up our camera and lights, the chap from The Big Issue came in to set up for his interview. I asked him if he had met Naismith before. "Oh aye, he's done a few things with us. He's a top lad."